What Happens If My Baby is Born Prematurely? Home > Premature Babies > What Happens If My Baby is Born Prematurely? Thousands of babies are born prematurely each year and it is a worrying time for parents. Here’s some insight into what happens if your baby is born prematurely. 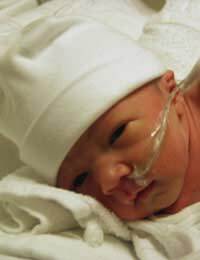 A premature baby is defined as being a baby that is born before 37 weeks – the earliest point at which a baby can be born and have a chance of survival is about 24 weeks. The reason why babies are born prematurely varies, with some cases having no known causes for it at all. The age of a mother can be a determining factor with young mums under 18 years of age and mums aged over 35 having an increased risk of giving birth prematurely, plus there are risks of premature births linked to various health conditions. Whatever the reason for the early delivery, it can be a very worrying and traumatic time, as life is thrown into disarray by the untimely arrival of a newborn. Not only that, but you’re also faced with extra challenges and are likely to be physically parted from your baby whilst your he or she is looked after in hospital. Premature babies will be kept in hospital for a while and are likely to be in the Special Care Baby Unit (SCBU). When babies are born prematurely, they’re often very tiny, haven’t experienced all the growth and maturity that a full-term baby will have and may be suffering from breathing problems or other health issues. Breathing problems, for example, are commonly experienced by premature infants, as their lungs haven’t matured fully. If this is the case, then your baby may be put on a ventilator, to help them breathe, and their breathing will be carefully monitored. Other tests will be carried out regularly to assess your premature baby, such as taking their temperature, measuring their heart rate and their blood pressure. To feed your baby and give medication, the nurses may need to have intravenous lines, or IV, inserted. To help keep your baby calm, warm and comfortable, they will be sleeping in an incubator for much of the time. Staff will keep a close eye on your baby, and any heart monitors or breathing equipment that he’s wired up to will provide monitoring all the time. As they’re born young, premature babies haven’t fully developed their own ability to regulate their temperature – they won’t show any signs of being too hot or too cold, like sweating or shivering. So the incubator, with its constant, regulated temperature will be the best environment for them to be in. Even though your baby may be wired up to machines and in an incubator, you can still do plenty to help them and aid the bonding process. Talking to your baby is great, as it’s ideal if they can hear your familiar voice. You may well be required to provide breast milk, through expressing your milk, as this will provide your baby with plenty of nutrients. You might also get the chance to change nappies – a bit tricky when there are lots of wires – and offer Kangaroo Care. This is a form of skin-to-skin therapy, where you get to hold your baby, however briefly, for while against your bare skin, inside your clothes. The nurses in the SCBU will explain how to do this – the main benefit is that it keeps your baby warm when nursed in this way. One other thing to be aware of is that your baby may be at greater risk of infection, as their immune system won’t have fully developed yet. So you should take care to always wash your hands before touching your baby, wear a mask if you have a cold or cough, and avoid contact with anyone with germs. It’s a tough time when your premature baby is in hospital, and hard to deal with seeing your baby wired up in an incubator, and not at home with you. But Special Care Baby Units do provide excellent care for babies and help give them the care and attention they need, so keep strong, remain positive and hopefully your baby will grow stronger every day and soon be home with the family. How Do Premature Babies Fare in the Long Term?